The First Light Battery was engaged near Richmond, Virginia, during the fourth day of the five-day Battle of Proctor’s Creek that took place from May 12 to 16, 1864. A Confederate artillery shot fired that Sunday morning hit the hub of the gun wheel, and the band ricocheted off and struck Curtis Bacon. William Davis of Guilford, who was “thumbing the vent” of the gun (a method of preventing fragments from the previous cartridge flaring up and creating a premature discharge) received wounds in the face and chest from splinters and iron shards. Comrades of Bacon and Davis believed Davis’s wounds were mortal, but expected Bacon to survive. In fact, Davis had no serious injuries, while Bacon died on July 10, 1864, from gangrene that developed as a result of his wounds. 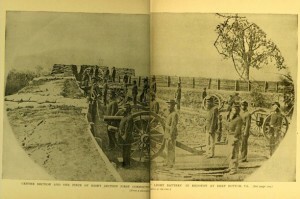 First Connecticut Light Battery at Deep Bottom, Virginia, 1864, from History of the First Light Battery Connecticut Volunteers, 1861-1865. Personal Records and Reminiscences, Vol. 2 by Herbert Beecher. The First Light Battery, Connecticut Volunteers organized in October 1861. Volunteers came from all over the state, with many from New Haven and Guilford. The regiment sailed with 156 men to Port Royal, South Carolina. The First Light Battery fell under the authority of the Union Department of the South until April 1864 when authorities ordered its transfer to Virginia under the command of General Alfred Terry of Hartford. The unit was mustered out of Richmond in June 1865 and was the first Connecticut regiment to return to the state at the end of the war, on June 14, 1865, with 120 men. What was a Light Battery? There were two types of Civil War artillery: heavy (foot) and light (field). In addition, there were two types of light artillery: horse, in which all soldiers rode horses, and mounted, in which men marched alongside of the cannons. A typical light battery consisted of six guns, each attached to a limber pulled by six horses. The caisson, connected to a limber and pulled by six additional horses, carried two chests of ammunition and a spare wheel. Each light battery carried around 1,200 rounds. The First Light Battery fought in 20 engagements during the Civil War. Two battles stand out in particular in the regimental history. The first was the Battle of Chester Station in Virginia on May 10, 1864. During the fight, Company A of the Battery ran out of ammunition, and its troops and guns became vulnerable to capture from a Confederate surge. 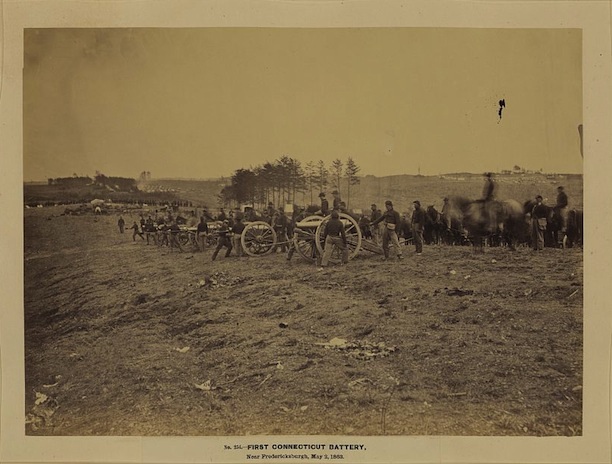 This they avoided thanks to the timely arrival of two other sections of the First Light Battery and several companies of infantry, including the Seventh Connecticut, sent by General Terry. Historians consider the outcome of this battle a draw. The second prominent engagement was the Battle of Proctor’s Creek, in which the gun wheel sustained the previously mentioned damage. Early in the battle the battery exchanged heavy fire with Confederate guns that covered advancing Confederate troops. But with the support of Union infantry regiments, the First Light Battery held. The battery also repulsed a Confederate charge at sunset on the third day of the battle. Historians generally consider Proctor’s Creek a Confederate victory, however. The regiment lost two soldiers killed in action. Twenty soldiers died from disease during active service. Officially, 13 men from the unit received wounds during the war. An additional 16 soldiers show up in post-war pension reports as having been injured. In total, the unit suffered 51 casualties. The first death in the battery occurred before the regiment even engaged in battle. Henry Bullard of Guilford died of typhoid just as the battery arrived at Beaufort, South Carolina, near Port Royal, after its week-long sea journey from New York. First Lieutenant George Metcalf of Hartford died on May 14, 1864, from wounds received at the Battle of Proctor’s Creek. Metcalf had been commissioned by Connecticut Governor William Buckingham to recruit the battery. The members of the regiment elected him Second Lieutenant in 1861. (Election of officers by soldiers was common practice in volunteer regiments during the Civil War.) Metcalf received a promotion to First Lieutenant in February 1863. 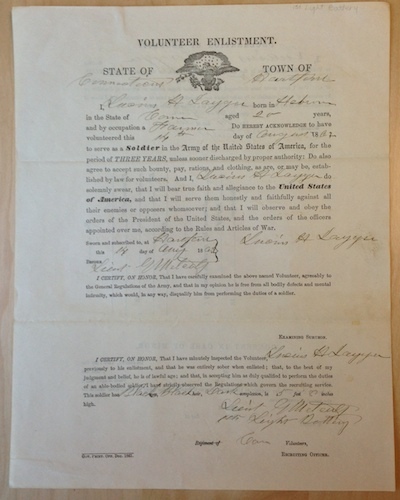 Henry Wilmot of East Haven enlisted on January 18, 1864. He also died in action at the Battle of Proctor’s Creek on May 14, 1864. Curtis Bacon of Simsbury, who died as a result of the gun wheel incident at Proctor’s Creek, was the first man to enlist from his town in October of 1861. He chose to re-enlist as a veteran on December 19, 1863. Bacon died in a hospital a little over six months later. Rockwell was born in Norwich on October 15, 1834. 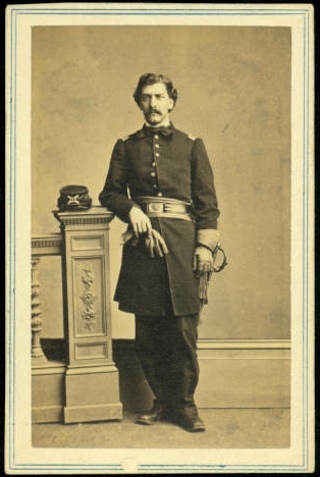 After his service to the First Light Battery, he received a promotion to Colonel of the Sixth Connecticut Volunteers in June 1864, and then to Brigadier General in March of 1865. After the war, he became professor of mining at Yale University and the Institute of Technology in Boston. He served as Chairman of the Board of Fire Commissioners for the city of Boston. Later, he served as president and executive of several mining and manufacturing companies. It was no accident he was elected the first president of the First Light Battery Veterans Association at its initial reunion in 1868. The soldiers of the First Light Battery had regular encounters with African Americans, both civilians and soldiers, while the regiment was fighting in the South. Beecher described these encounters throughout the regimental history he authored. Battery soldiers recognized the achievements of African Americans in combat and their ability to withstand the especially brutal treatment they received when captured by Confederates. At the same time, however, soldiers of the First Light Battery from Connecticut maintained many of the racist stereotypes and hostile approaches to African American relations commonly associated with life in the Confederate South. Beecher told of the perpetuation of derogatory stereotypes, such as blacks only being interested in living off government rations. More troubling, he recounted how Union authorities actually rounded up African Americans and forced them to work for the Army. These are just a few examples of how the soldiers of the First Light Battery, like many white Northerners, had a complex and ambiguous relationship with African Americans. They risked and sometimes lost their lives to end slavery, while at the same time they accepted and perpetuated racism. The First Light Battery Veterans Association began holding annual reunions in towns around the state beginning in 1868. Rockwell soon moved to Boston, and Edward Griswold of Guilford became president and served for many years. Herbert Beecher, who wrote the regimental history, became vice-president of the Association. Guilford and New Haven became the centers of reunion activities, in part because so many men of the regiment originally came from those towns. At the 17th Reunion in 1884, veterans set up a week-long encampment in Guilford. A typical reunion, such as the one held in West Haven in 1899, drew 42 regiment veterans and 32 guests. Around 1900, the First Light Battery Veterans Association began advocating for the construction of a monument to the regiment. In 1903, the State of Connecticut appropriated $3,000 each to several regimental veterans associations, including the Sixth, Seventh, Ninth, and Tenth Infantry units and the First Light Battery for the purpose of building a Civil War monument. The First Light Battery pledged to raise an additional $10,000. 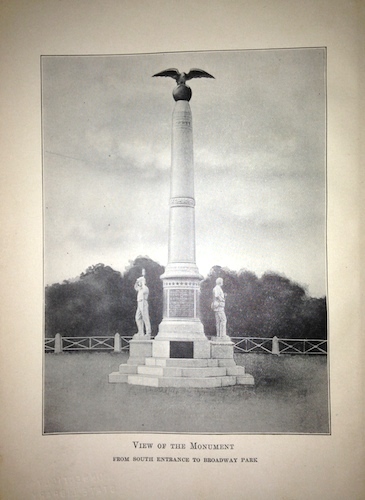 In 1904, the veterans associations of different regiments agreed to unite with civic organizations to facilitate the creation of a Civil War monument. On June 16, 1905, officials unveiled a monument to the First Light Battery and the Seventh and Tenth Infantry regiments in New Haven. The last record of the First Light Battery Veterans Association in the Hartford Courant was in 1904, when the Association passed a resolution in commemoration of A. P. Rockwell, who died the previous year. After the gun wheel was damaged at the Battle of Proctor’s Creek, Captain Rockwell sent it north. In the years after the war, he offered it to a number of historical societies around the state, but none expressed interest. In 1881, Rockwell donated the wheel to the First Light Battery Veterans Association. It is possible, though this is speculation, that the painted battle names and dates were added around the wheel at this time by the men who knew them best—the veterans of the First Light Battery. By 1882, C. E. Longley put the wheel on display in his storefront on Church Street in New Haven. That same year a special committee of the Battery Veterans Association formed and it obtained permission to have the wheel placed as a war relic in the Hall of Flags at the State House in Harford. 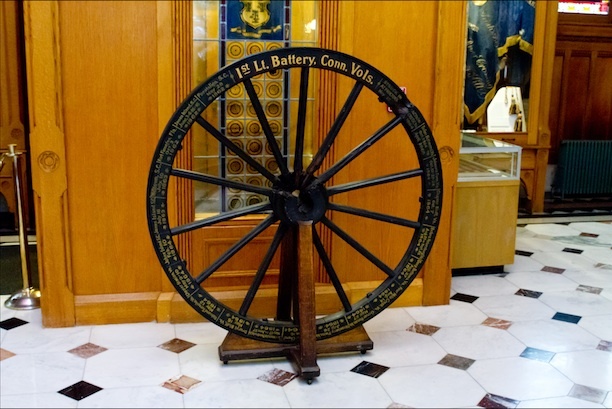 The gun wheel of the First Light Battery, Connecticut Volunteers arrived at the Connecticut State Capitol in December 1883. “History of the First Connecticut Volunteer Light Battery.” Connecticut Military Department, 2014. Link. Burton, John H., Austin A. McKinney, and Alfred Perkins Rockwell. “Catalog Record for Connecticut Volunteer Regiments Records, 1861-1876.” Connecticut Historical Society Library Catalog, 2014. Link. Beecher, Herbert W. History of the First Light Battery Connecticut Volunteers, 1861-1865. Personal Records and Reminiscences. Vol. 2. New York, NY: A.T. De La Mare Ptg. and Pub. Co., Ltd., 1901. Link. Beecher, Herbert W. History of the First Light Battery Connecticut Volunteers, 1861-1865. Personal Records and Reminiscences. Vol. 1. New York, NY: A.T. De La Mare Ptg. and Pub. Co., Ltd., 1901. Link.